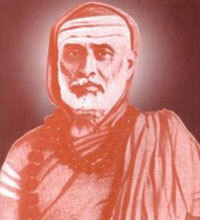 He was ap¬pointed as the 34th pontiff of Sri Sringeri Sharada Peetam on 6th April 1912. Being an introvert, he was given to meditation and used to attain samadhi very frequently. With his remarkable control over meters, and divine inspiration, he used to compose stanzas. Only a few of them could be compiled and printed for the benefit of posterity and devotees. Pādāvalambanastuti, Navaratnamālā, Totakastotram, Srīmad-āchāryendrastavah, Āchāryapādāvalambanastutih, Dattanavaratnamālikā, Dakshināmūrti-mantramātrkāstavah, Srīsāmāstakam, Sanmukha-bhujanga-stuti, Pañcadaśīstutih, Mīnākshīstutih, Mīnāksīstotram, Vānutakarsamañjarī, Srīśāradāgītam, Sāradābhujangam, Deśikotkarsa-mañjaī, sanmukhapañcaratna-stuti­ and so on. Swamji has composed a number of shastric works, which include a commentary on Shankarācārya’s Vivekacū∂āmanī (pub. by Bharatiya Vidya Bhavan). He is reported to have written an¬other scholastic commentary in Sanskrit on the Shankarabhashya of Srīmad-Bhagavadgītā. This commentary is yet to see the light of the day.